Online slot developer Microgaming enjoyed a wealth of success with its Untamed Bengal Tiger slot so the release of a second slot in the Untamed series was more a case of “when” and not “if”. It was not long before the developer released this little beauty. It's Untamed Bengal Tiger... Without the Bengal Tiger! Untamed Giant Panda takes everything that was loved about Untamed Bengal Tiger and replicates it… just with a giant panda instead of the Bengal tiger. Seriously, you could pretty much put the slots next to each other and asides from the animals there really isn’t anything different between them. It is only the fact that the giant panda has replaced the Bengal tiger, otherwise I'd be copy and pasting my Untamed Bengal Tiger review into here. 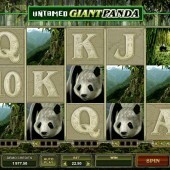 This slot is a 5 reel, 243 ways to win title that has a theme set in the jungle with the giant panda as the focal point. The symbols are made up of a giant panda sitting down, a giant panda staring forward and a giant panda’s eye acting as the Scatter. There’s also a Wild symbol that is represented by the Untamed Bengal Tiger logo… sorry, I mean the Untamed Giant Panda logo. Freudian slip there, please excuse me! Honestly, all the features from Untamed Bengal Tiger are here. 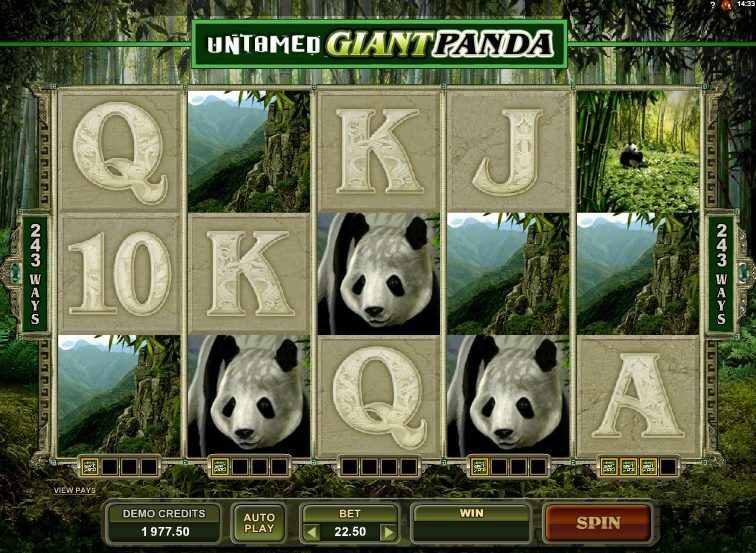 You can expect your luck to be in every now and then with the giant panda’s eye Scatters sometimes nudging onto the reels to trigger the free spins bonus round. If your luck isn’t in and you don’t get a Scatter to nudge then you will need to hit three or more of the bad boys to trigger the free spins. Once triggered, you will be awarded with 10 free spins. Wait, this is worse than Untamed Bengal Tiger! You could get 20 free spins on that slot! This slot is a step in the wrong direction! Anyway, there’s also the Collect a Wild feature where every time you hit a Wild on the reels it will be added to the collection of Wilds below that specific reel. You must collect four Wilds on a single reel in order to trigger the Wild to expand over the entire reel for four spins. It should be noted that you can trigger an expanding Wild over a whole reel on more than one reel if you collect enough Wilds. Oh wait, there is one small change in this slot compared to Untamed Bengal Tiger. This comes in the form of the creatively named Brilliant Wilds. This feature is activated in the free spins and if you hit a Wild across the reels during the free spins then that Wild will remain stuck in its position for the remainder of the free spins. In layman’s terms, this is a Sticky Wild! Ok, so maybe I was a bit harsh to begin with. This slot is not just a cheap rip off of Untamed Bengal Tiger. It is very similar and for a minute I even suspected that the Bengal tiger had just changed into his giant panda birthday suit and come back on set for some cheeky photos. That is a theme that did not change with the other slot in this series Untamed Wolf Pack. However, the Brilliant Wilds have saved the day and for that alone this slot is worth giving a try. I will probably just stick to playing Untamed Bengal Tiger. You know what they say, you can’t beat a classic!